Figure 4 Schematics of an algal pump to concentrate dissolved inorganic carbon (DIC), C4 photosynthesis, and CAM photosynthesis. 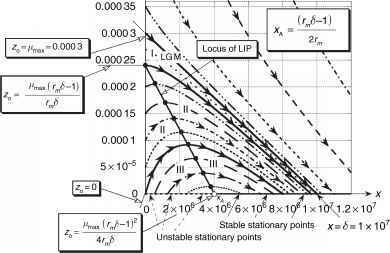 In the DIC pump, ATP is used to pump protons out of the cell. Protons re-enter through a co-transport protein that brings bicarbonate (HCO3) into the cell. Bicarbonate then enters the pyrenoid where it is converted to CO2 by carbonic anhydrase (CA), and fixed by Rubisco localized in the pyrenoid. See text for descriptions of the C4 and CAM pathways. 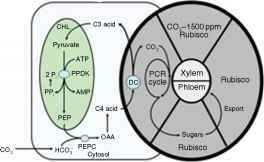 CHL, chloroplast; DC, a decarboxylating enzyme; PEPC, PEP carboxylase; PCR, photosynthetic carbon reduction cycle; PPi, pyrophosphate. form woody tissues and grow as shrubs and small trees. With one exception in Hawaii, no tall-stature trees are C4 plants. Despite the far fewer numbers of C4 than C3 species, C4 biomass contributes about 25% to the global primary productivity, and biomes with significant numbers of C4 plants cover about 40% of the terrestrial surface of the Earth. In C4 photosynthesis, Rubisco is localized into an interior tissue layer immediately surrounding the vascular tissues in the veins of leaves and photosynthetic stems (Figure 4). This is commonly called the bundle sheath tissue. The enzyme PEP carboxylase is highly expressed in a layer of mesophyll cells surrounding the bundle sheath tissue. PEP carboxylase binds bicarbonate (from CO2) to PEP to form a four-carbon organic acid, oxaloa-cetic acid (OAA). OAA is modified to malate or an amino acid, and transported to the bundle sheath tissue where Rubisco is localized. There, the four-carbon acid (or C4 acid) is decarboxylated to release CO2 and form a three-carbon product. This three-carbon product is then returned to the mesophyll tissue where it is converted back to PEP using ATP. 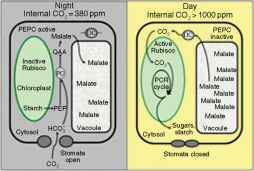 The released CO2 accumulates to high concentration in the bundle sheath where it is refixed by Rubisco and processed into sugars by the normal C3 mode of photosynthesis. C4 photosynthesis is most successful in conditions where photorespiration is high, namely hot and often-arid environments (Table 1). In plants of similar lifeform and ecological habitat, C4 plants typically have higher photosynthetic capacities than C3 plants above 30 °C, but lower photosynthetic capacity below about 18 °C. As a consequence, C4 plants can dominate open habitats where hot conditions prevail during the growing season, for example, during the summer in the temperate zone, and in low-elevation regions of the tropics and subtropics. In addition, C4 plants have little ability to establish in deep shade of forests, due in part to the additional energy cost of operating the C4 metabolic cycle. Because of this, a general rule is that woodland plants utilize C3 photosynthesis, while in warm climates, most of the grasses in open, sunny locations use C4 photosynthesis (Table 1). Forest biomes are thus C3 systems, while warm-climate grasslands are C4-dominated systems. Only in arid regions in the tropics, subtropics, and warm temperate zone do woody C4 shrubs become important on a landscape. C4 plants also have a high water-use efficiency (WUE) compared to C3 plants, and this contributes to their success in arid or highly saline environments (Table 1 ). Because ofenhanced WUE, many ofthe arid and semiarid regions of the world have higher NPP than would otherwise be possible, and in some situations, landscapes that would otherwise be barren support complex C4-dominated plant communities (e.g., the saline grasslands and shrublands of the hot deserts in Africa and Asia). Enhanced WUE also improves salinity tolerance, and for this reason C4 grasses and sedges are important salt-marsh species in temperate to tropical latitudes.